I have been toying with bikes for some years now. First there were the mountain bikes and after a hiatus of two years I started with my first fixed gear bike. 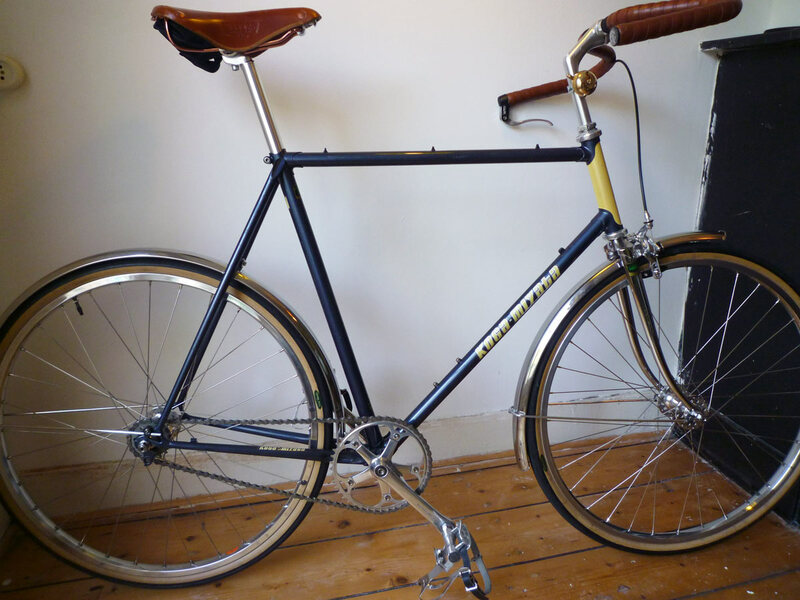 I can’t remember how I got triggered to build a fixed gear bike, but it probably had something to do with the simplicity (I very much like the clean look) and the fact that they do not require a lot of maintenance. The frame I bought for my first project was an old Koga Miyata that was powdercoated white by the previous owner and had already been used as a single speed bike. When I got tired of the white hipster frame I tracked down a second Koga Miyata using Marktplaats, the dutch equivalent of eBay. I stripped all the parts (a combination of newish and incredibly old stuff) and slowly started buiding a totally different bike. At some point I decided I wanted a more comfortable ride, which meant bigger tires, and fenders to keep me dry in the winter. 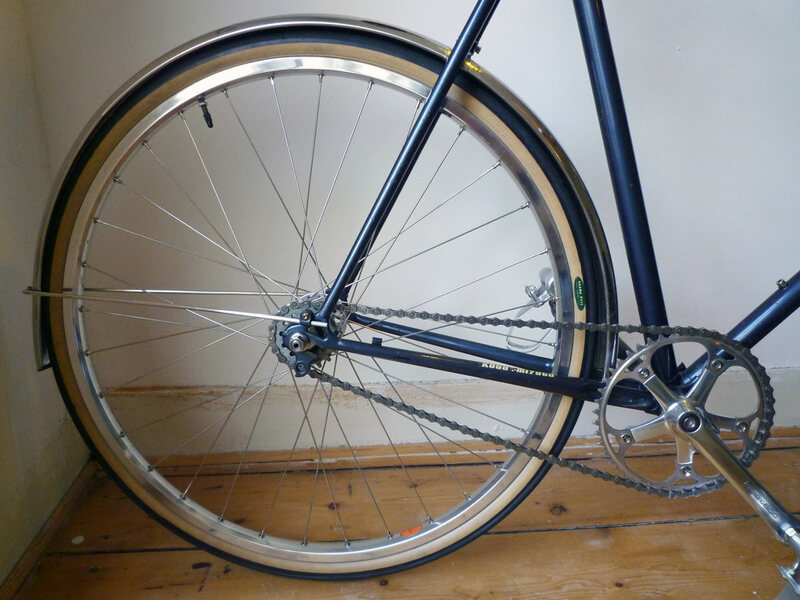 The Koga already had eyelets for fenders but there wasn’t much room for the 32C (or bigger) tires I was thinking of. 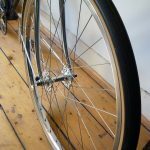 By that time I had already read about the 650b wheels, a size between 26″ and 700C, that was/is going through a revival. After reading the article about a 650b conversion on M-Gineering.nl, I decided to order a 650b fixed wheelset. 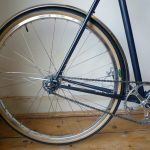 I asked Marten Gerritsen to build a wheelset with the Velo Orange Diagonale rims and Aby-K hubs and after a few weeks the mailman dropped off a nice & shiny pair of wheels. I have been using them for the last six months and the wheels are fantastic. The Grand Bois 32C tires ride a lot better on cobblestones and the 650B wheels are really nice and a perfect match with the stainless steel fenders (also from M-Gineering). 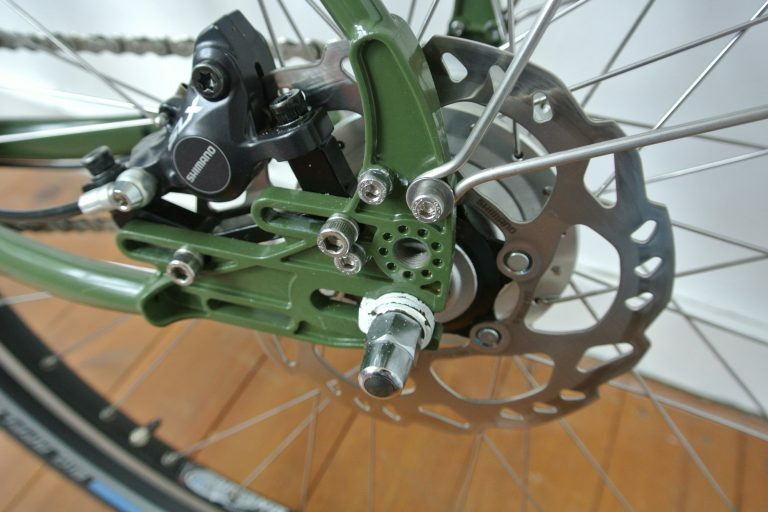 Of course I had to use a longer caliper brake, but the R559 Tektros stop in a heart beat, have a quick release big enough for the Grand Bois Cypres tires and are really well made. Every once in a while I wipe the bike down to keep the wheels nice and shiny, the rims are polished and I’d like to keep them that way. 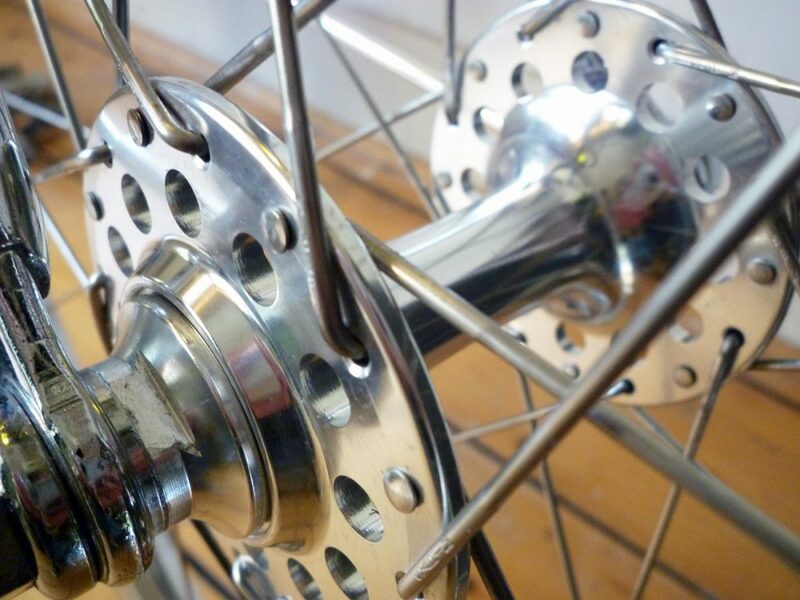 I really like the box-section rims by Velo Orange because they have a nice vintage look, a lot of the available 650b wheel rims are a lot more modern/flashy. I like the Grand Bois tires so much that I am considering getter bigger ones for my other fixed gear and geared bike as well. I just have to decide which ones! Anyway, if you need more room for fenders and fatter tires I would encourage you to get some 650b wheels, they are a very good alternative. 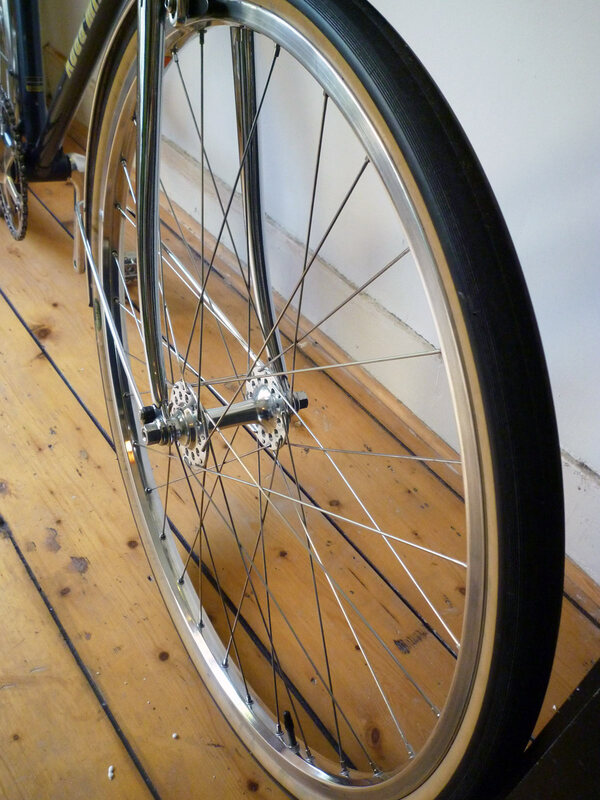 But because of the limited availability of these wheelsets they are not going to be as cheap as a pair of 700C wheels. 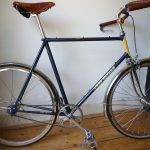 And also read some general guidelines, for example those by Rivendell Bikes or the famous Sheldon Brown, to decide if your frame is a suitable candidate! PS: This is my first post about bikes and the first one in English. Because a lot of the things I have learned and read came from English blogs and forums, I thought it would be nice to ‘give’ something back.